Tech Mahindra and Cisco today launched a state-of-the-art Digital Experience Center in Bangalore. The center Located at Tech Mahindra’s Campus is aimed at showcasing use cases for digitization in manufacturing, retail and smart cities. Use cases ranging from asset visibility and yard tracking, city surveillance and incident management, Smart Lighting, Smart Parking, Waste Management, Environmental Monitoring, City Wi-fi, Machine Connectivity, Warehouse Task Allocation, etc. will be showcased at the center. 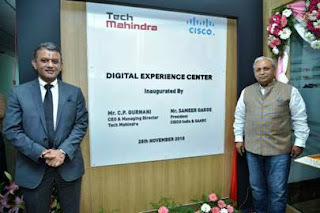 The center was inaugurated by C.P Gurnani, Chief Executive Officer and Managing Director, Tech Mahindra and Sameer Garde, President, Cisco India, and SAARC. Delivering business value through digitization requires a new approach and capabilities. We are excited to collaborate with Tech Mahindra to launch the Customer Experience Center, built exclusively for emerging growth verticals like manufacturing, retail, and smart cities. This world-class facility will showcase some of the most innovative solutions that can solve some of the biggest challenges faced by our customers. Together, Cisco and Tech Mahindra will expand reach into these emerging areas and tap into bigger opportunities. “Tech Mahindra along with Cisco have partnered to create this state-of-the-art Digital Experience Center that showcases real-life solutions on Smart Cities, Digital Manufacturing and Digital Warehousing. This command and control set up integrates with Cisco platforms on Kinetics for Cities like smart lighting, environment monitoring, waste management, etc. and also on Kinetics of Industries like manufacturing and warehousing solutions”, said, CP Gurnani, MD & CEO, Tech Mahindra. “The objective is to create a simulated environment of solutions to showcase our joint capabilities in implementation and operations. Overall collaborating, using technology and creating solutions that add value to our customers,” he added.